This Xtreme Obstacle Course will surely give your party guests the excitement and thrill they all have been looking for. 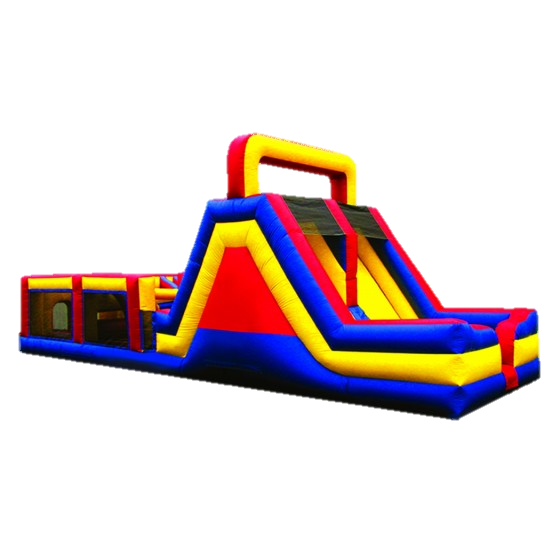 Have fun as everyone, no matter what their age, will enjoy this Inflatable Obstacle Course. Oh yeah. Did I mention it has a Dual Slide? From back yard birthday parties to large events like school field days, church events or company picnics, obstacle courses are a great choice for kids and adults alike. We are also so excited to bring you our brand new Wrecking Ball. 4 players stand on pedestals and attempt to knock their opponents off theirs. This game is HUGE and will be the highlight of any event. Do you like competing? Then get your crew together! Get ready to race while you climb, crawl, deal with obstacles, go through holes, cross over lanes, and finish at the end of the 16' dual lane high slide. These awesome inflatable challenge courses offer players a chance to test thier skills against multiple obstacles!! Everyone has a little competitive side to them, so let your's shine by competing on our Obstacle Xtreme Challenge with your pals!